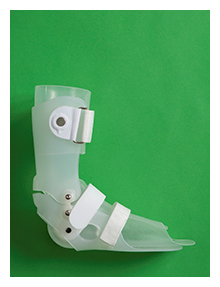 The Dynamic Response Ankle Foot Orthosis (DRAFO®) from Bracemasters International LLC is a custom orthosis promoting more holistic, positive outcomes and improved quality of life. DRAFO is a completely new approach to orthotic intervention in treating children and adults with varying neuromuscular and orthopedic pathologies. 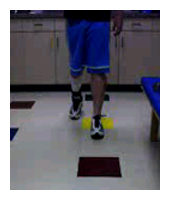 Teamed with new assessment and alignment techniques, this new design changes how gait has been traditionally assessed. According to Bracemasters, the DRAFO design is conceptualized as a total contact/total control orthosis that provides relief and flexibility over bony prominences while delivering rigid control. One of the unique features of the DRAFO is a flexible heel, which provides proprioceptive feedback at heel strike and a SACH heel effect that helps enhance gait performance and stability. "Our goal is to create more functional and effective compromises than those currently available to the patient for ambulation," said Davin Heyd, CO, vice president of program development for Bracemasters. "The DRAFO is designed around a scientifically validated, biomechanical analysis process and functional gait. It represents the future of dynamic bracing utilizing biomechanical alignment by providing total contact and total control with a dynamically flexible orthosis, which can truly attain triplaner control and stability." Heyd explains the DRAFO is a two-part system with a flexible inner shell and rigid outer shell. The inner shell is inherently skin-friendly and very protective of the skin and allows the foot to be in total contact. The rigid outer shell can be as flexible or as rigid as is required for the patient's condition. One of the key characteristics of the DRAFO system is the calcaneal wrap, which locks in the hindfoot, and allows first rocker on heel strike. Acting as a SACH heel, it helps to achieve stability at heel strike, as well as deaccelerating the tibia to optimize the second rocker. Because it is soft, it provides proprioceptic feedback. 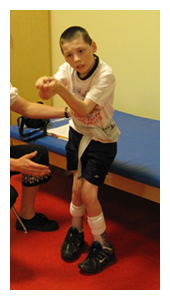 The DRAFO program began by serving the needs of cerebral palsy children with spastic tone or hyper mobility of the joints. One of the features was the ability of the DRAFO to stabilize and hold the lower extremity in an anatomically congruent alignment with little or no pressure problems. The key to the success of the DRAFO is that the patient care provider is able to biomechanically align the lower extremity to the floor to facilitate balance stability and the most anatomically normal gate as possible. The key to the DRAFO program is to not force alignment past the patients functional end range in dorsiflexion /plantarflexion and to align the foot for congruent stability and structure; if the alignment of the DRAFO is greater than their functional range, or congruency is not established in the foot, the orthotic device will not perform properly. Therefore, the DRAFO is a two-part system. The first is the device and how it intimately controls the alignment of the foot and ankle. The second is the biomechanical assessment and alignment process that is required for a successful outcome. Heyd said the system is designed to work with and enhance the outcomes of the research done by Elaine Owen. Optimize the postural, weight shift, and movement training process. X-rays of spine and hips, LLD questioned, but felt to be due to soft tissue constraints. Gait pattern: severe in-toeing R>L, IC on R forefoot and L foot flat, slow speed, forward lean with excessive weight on anterior shoulders, step length limited R>L, decreased foot clearance. Improved endurance for walking, allowing him to walk to the neighborhood park with his mother, using his reverse walker. Progress began to plateau and recovery from surgery achieved decrease in frequency. 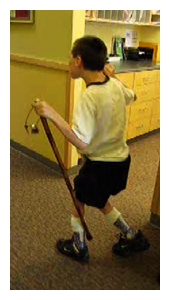 Improved independent standing from 9 seconds to 5 min (orthotist report). Lasting response: 40-60 seconds of standing. Casted and fit with a carbon fiber DRAFO utilizing the Strathclyde approach for alignment and fine tuning. One month later Bradi informed me that he was feeling so good that he reintroduced sports to his life- he played over the weekend in a softball tournament as the starting right fielder. Bradi's pain is now nonsignificant to his life! Patient states pain is 0, no pain! The DRAFO's flexible heel provides superior proprioceptive feedback at heel strike; initiates the first rocker at heel strike; and significantly reduces tendo-calcaneal pressure problems. This design is for controlling a buckling/crouch type condition, also referred to as excessive shank angle. Provides an intermediate solution for more traditional applications requiring a solid heel. The DRAFO Lite protects against hyperextension with a solid heel that induces forward vectoring at heel strike, unlike the deceleration experienced with a soft heel. The design also helps maximize stability while standing. 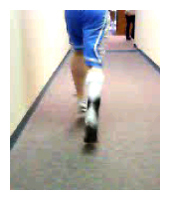 A custom solution to acute ankle instability, acute injury and injury prevention. It provides maximum medial-lateral control while delivering anterior-posterior flexibility. A special responsive plantar assist mechanism provides constant resistance to dorsiflexion, thereby reducing strain and accelerating recovery. The maximum control and stability with increased post injury mobility enables athletes to return to competition earlier. Serves those with a Symes or partial foot amputation. 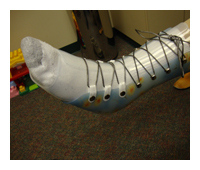 This Dynamic Response Prosthesis (DRP) was developed utilizing a unique blending of orthotic and prosthetic design elements. 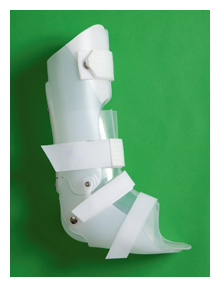 The orthotic components come from the key elements of the DRAFO product. The prosthetic element is provided by custom shaping a special foam material to fill the balance of the space in a conventional shoe. Together, the components deliver a level of comfort and control with greatly enhanced gait performance. The complete DRAFO line is appropriate when practitioners are treating a range of conditions that include: cerebral palsy; muscular dystrophy; traumatic brain injury; drop foot; talo-calcaneal varus or valgus; prophylactic ankle instability; spina bifida; multiple sclerosis; PTTD; ankle arthritis or DJD; ankle subtalar or midtarsal trauma; Down’s Syndrome; and CVA. Elaine Owen has been a practicing physiotherapist since 1974, first specializing in adult neurology and then pediatric physiotherapy. Since 1983 she has headed the Community Paediatric Physiotherapy Department for North West Wales, UK. She has post graduate qualifications in Lower Limb Orthotic Biomechanics (University of Strathclyde, Glasgow, Scotland) and Clinical Gait Analysis (University of Strathclyde). She has undertaken the Gait Analysis Instructional Course for the European Society of Movement Analysis of Adults and Children (ESMAAC). She has an MSc in rehabilitation studies, University of Strathclyde, which included a thesis about orthotic management of neurological conditions and normal gait and standing. She has undertaken both adult and pediatric Bobath (neurodevelopmental therapy) training. She has also trained at the Institute of Conductive Education, Budapest. She takes an elective view of the management of neurological disabilities, but with an emphasis on a biomechanical approach to rehabilitation. For 12 years, she has used the Orthotic Research and Locomotor Assessment Unit (ORLAU) transportable video vector gait laboratory at Bangor for gait analysis, orthotic, and physiotherapy management of children and adults. She is an international lecturer, invited to teach her course, which explores a fresh approach to the observation and analysis of normal gait and the management of gait disorders. The course aims to give a logical and comprehensive approach to the designing, aligning and tuning of orthoses and footwear, using kinematic and kinetic 2-D gait analysis. While these principles have been developed from mainly pediatric experience, they are equally applicable to working with adults. She has presented her work at the International Society for Prosthetics and Orthotics (ISPO) Triennial World Congress, Hong Kong 2004, Vancouver 2007 and Leipzig 2010, and also at the Annual Meeting of the European Society of Movement Analysis of Adults and Children, Leuven 2002, Warsaw 2004, Barcelona 2005, and London 2009. In addition to speaking at scientific meetings, she is a regular visiting lecturer at the National Centre for Training and Education in Prosthetics and Orthotics, University of Strathclyde, Glasgow. The next course offered by Elaine Owen in the U.S. will be June 10 -11, 2011 in Baltimore. For more information: Contact emarsh@careresources.net or visit www.careresources.info/general_info.php. The Office of the Inspector General (OIG) of the Centers for Medicare & Medicaid Services (CMS) has issued a new rule setting forth new procedures for screening of providers of medical or other services and suppliers in the Medicare, Medicaid, and Children’s Health Insurance Programs (CHIP) and other measures to prevent fraud, waste, and abuse in those federally-financed programs. The provisions of the Affordable Care Act implemented through this final rule include new provider screening and enforcement measures to help keep bad actors out of Medicare, Medicaid and CHIP. The final rule also contains important authority to suspend payments when a credible allegation of fraud is being investigated. Creates a rigorous screening process for providers and suppliers enrolling Medicare, Medicaid and CHIP to keep fraudulent providers out of those programs. Types of providers and suppliers that have been identified in the past as posing a higher risk of fraud, for example, durable medical equipment suppliers, will be subject to a more thorough screening process. Requires new enrollment process for Medicaid and CHIP providers. Under the Affordable Care Act, states will have to screen providers who order and refer to Medicaid beneficiaries to determine if they have a history of defrauding government. Providers that have been kicked out of Medicare of another state’s Medicaid or CHIP will be barred from all Medicaid and CHIP programs. Temporarily stops enrollment of new providers and suppliers. Medicare and state agencies will be on the lookout for trends that may indicate health care fraud – including using advanced predictive modeling software, such as that used to detect credit card fraud. If a trend is identified in a category of providers or geographic area, the program can temporarily stop enrollment as long as that will not impact access to care for patients. Temporarily stops payments to providers and suppliers in cases of suspected fraud. Under the new rules, if there has been a credible fraud allegation, payments can be suspended while an action or investigation is underway. These new anti-fraud and abuse measures provided for in the Patient Protection and Affordable Care Act (ACA) are effective beginning March 25, 2011. Please feel free to submit your questions on the DRAFO as well as any other issue you would like addressed. We hope you have found this third issue of the Orthologix E-news informative.